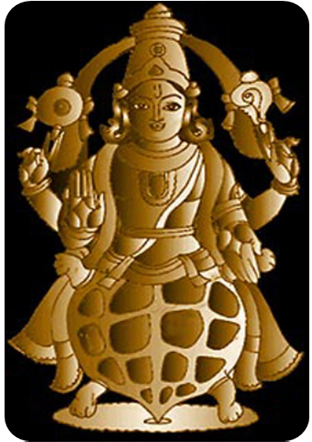 sinking due to its greate weight then lord Vishnu take the form of tortoise to form the base. That prevent it from shinking. The Laxmi markings are clearly visible on the middle of the Shila and the body of the Shila is like that of a Kurma which have Mandara mountain over the back of the Kurma. The Kurma Shaligram also works as a shield against all evil and gives immense protection to the worshiper. The worshiper of this Shaligram gets immense strength, power, patience, prosperity, peace, wealth and happiness in his life. He gets support of all and success in his business and service. It emits extremely high energy levels. Since Kurma is a water animal it brings immense flow of wealth as well.